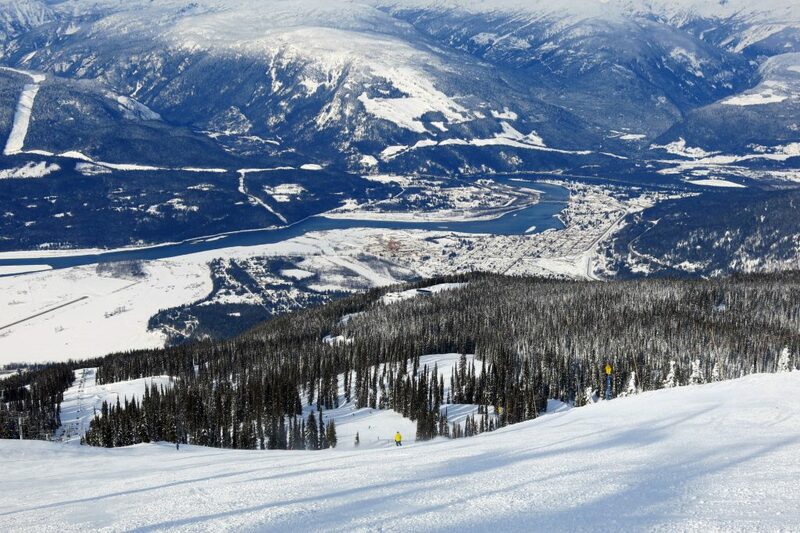 Revelstoke is the northernmost resort on the Powder Highway of interior British Columbia. With the most vertical drop in North America, lots of natural snow, and spectacular scenery, it is easy to rank this resort right at the top of our list. 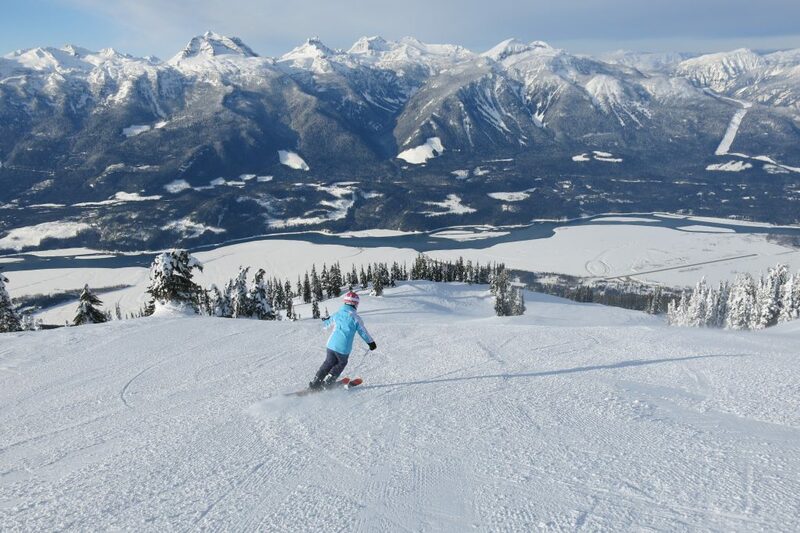 Revelstoke is simply one of the very best ski resorts we’ve ever been to. 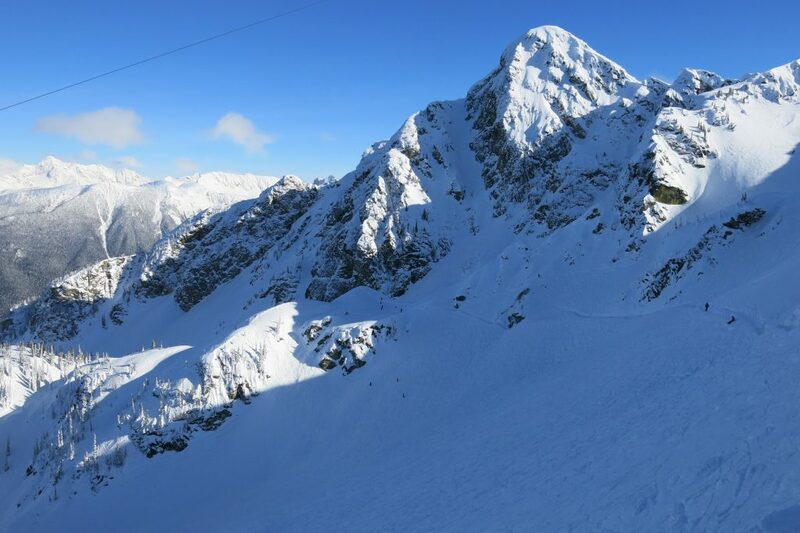 It has everything every serious skier is looking for: Massive vertical, lots of natural snow, cold temps giving it perfect snow quality, steeps, bowls, tree skiing, lack of crowds, scenery, and variety. We are ranking it as #2 on our list behind Telluride, which just barely edges it out on our list because of the town of Telluride and the fact that Revelstoke has just begun building out their lift and base infrastructure whereas Telluride is complete. 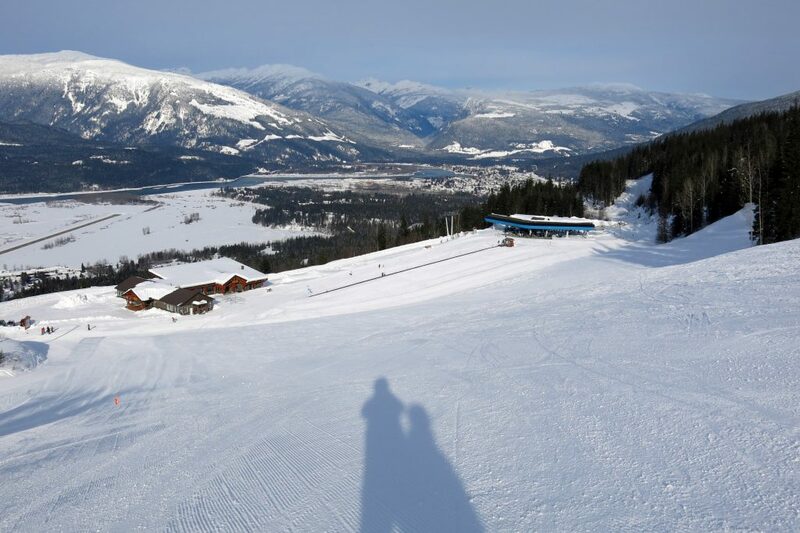 Every day at Revelstoke begins in the village at the base of the Gondola. This is the only access to the mountain at this point. The master plan for the resort at buildout lists 22 lifts with 2 more lifts reaching the base, but for now that is the only way to get up the mountain. I’ve seen photos of long lines there on a powder day, but we didn’t experience any lines at any of the 4 lifts. 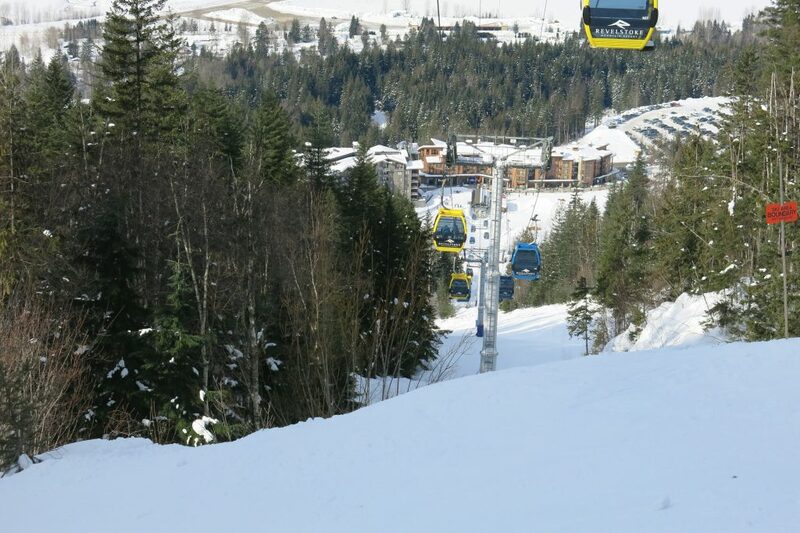 In both the 2018/19 and 2019/20 season they are adding cabins to the gondola to increase capacity to the maximum the lift can handle so powder day lines should improve. I say “4 lifts” because the gondola is actually 2 separate gondolas and you have to unload at the mid station to get on the next stage. We were sitting there like dorks the first time and the attendant asked us if we wanted to stay on and go back down. Doh! From the top of the 2nd stage of the Gondola you can access the Stoke chair, which is one of the 2 main upper mountain chairs. 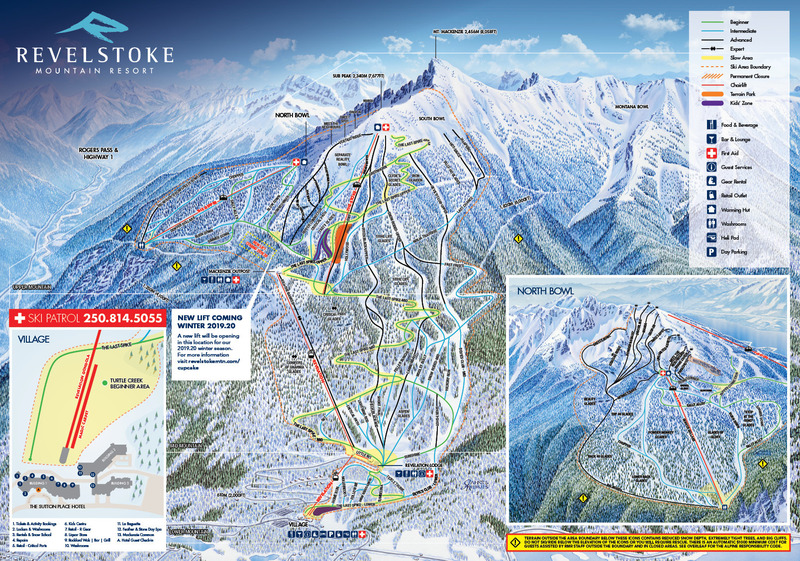 That’s where you will find the best views and a paradise of long groomed runs and natural ungroomed and gladed terrain. At almost 2,100 feet of vertical, this chair will surprise you with how long it takes to get down. This is only the top 1/3 of the resort, and the scale is deceptive. 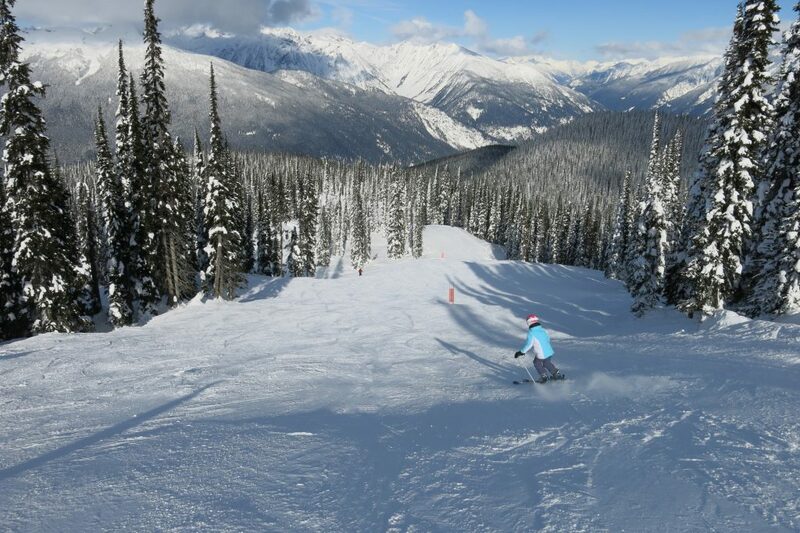 At most resorts 2,100 ft of vertical is the whole mountain, but at Revelstoke you continue down another 3,600 feet. Snow Rodeo and Pitch Black are probably our favorite runs in the world. It’s an amazing experience even though when we got to the top on the day we were there it was SUPER cold with a windchill of -37C. Brutal, but we took pictures anyway, risking our fingers in the process because the view is incredible. The Stoke Chair is the only way to get over to the Ripper chair currently. 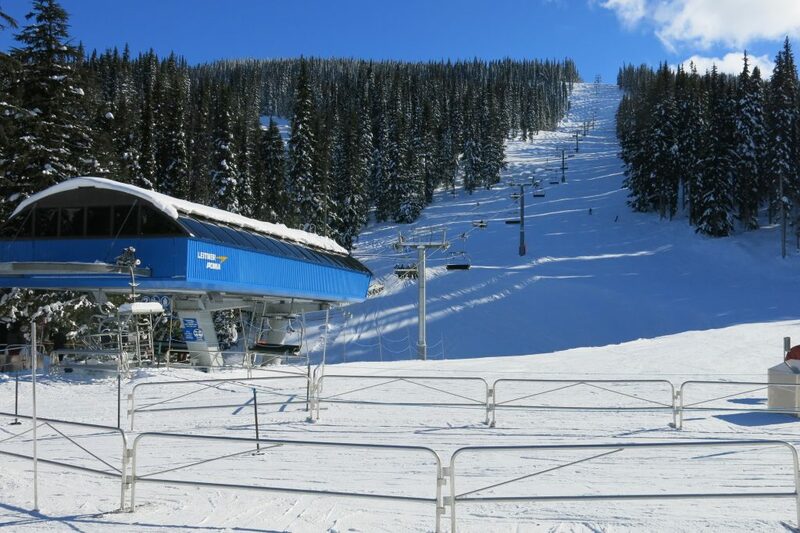 That will be changing in the 2019/20 season with the installation of the Cupcake chair which will open up some upper mountain beginner terrain and allow skiers to get over to Ripper quicker. 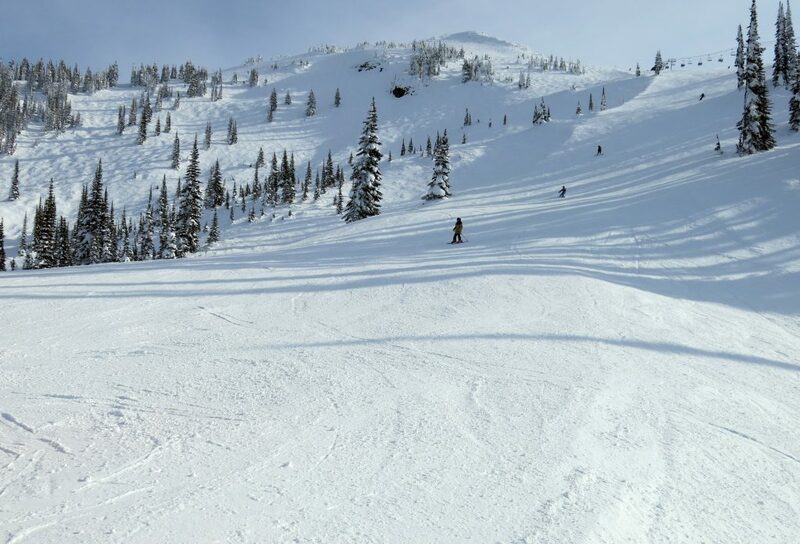 Ripper is a rare high-elevation chair in BC that faces due north. 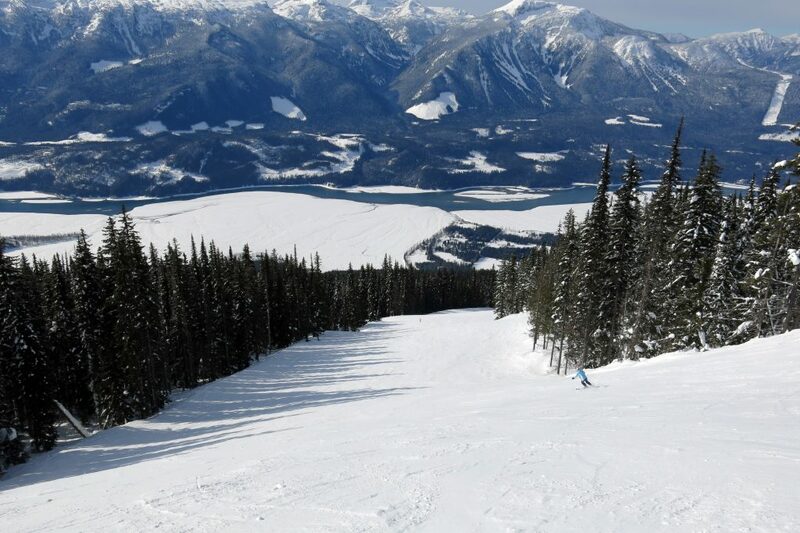 Being so far north, the north-facing slope is shady much of the time, but the snow is great and this is where most of the legendary Revelstoke glades are. From the top of Stoke you can also take a short hike up to access the spectacular North Bowl area. 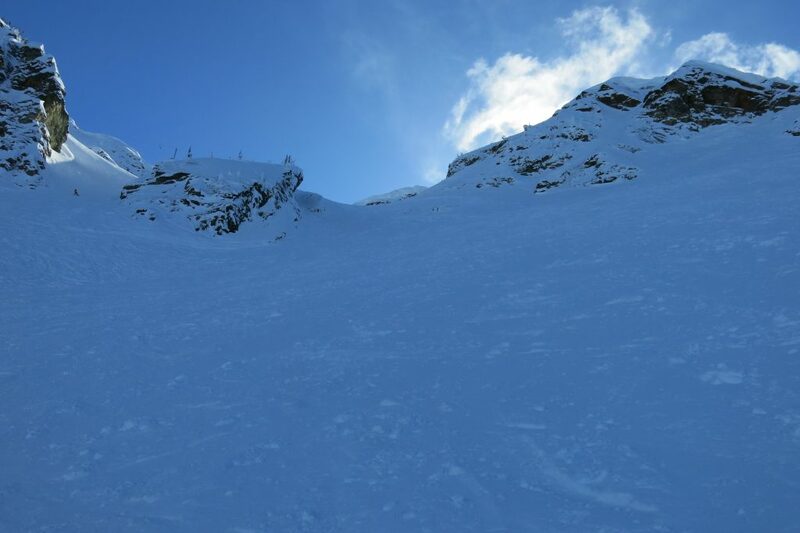 This is some spectacular bowl terrain that is fairly steep but not crazy. A longer hike will get you the uppermost, longest lines down, but even the short hike will get you a ton of vertical. 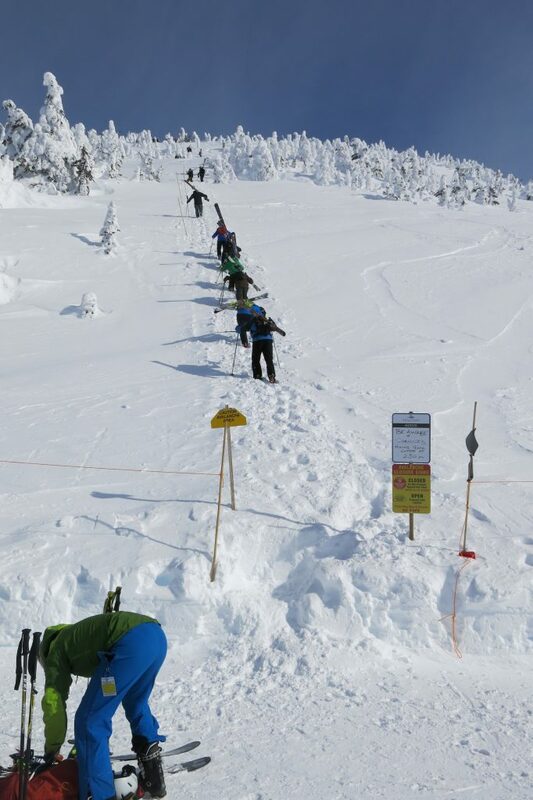 Beware that the ski out is long and difficult though, and it make the area deserve it’s double-black trail ratings. 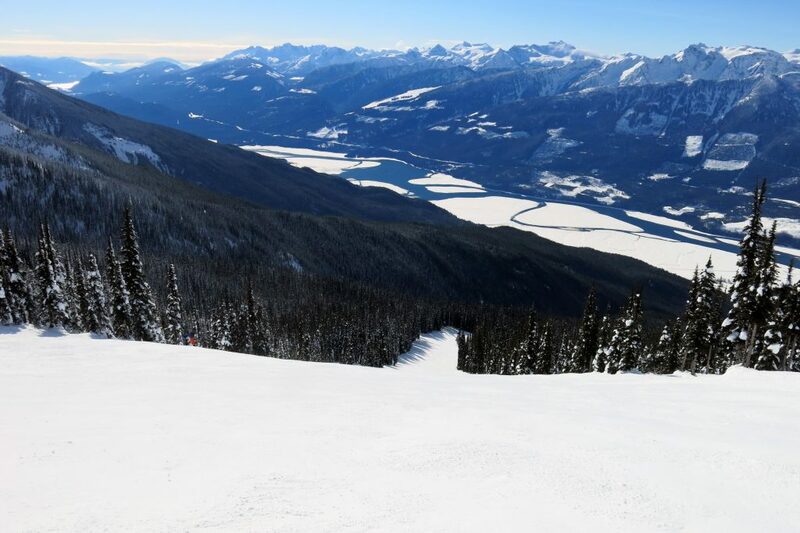 Revelstoke has the lowest skier density per acre for any major resort in North America according to their master plan addendum in 2017. This is one of the best things about the resort and something that is unforgettable as you fly down the miles-long steep groomers that are mostly empty. I have to wonder if the resort ownership will survive though. They say the first 2 owners of a resort typically go bankrupt, but I hope not because we love how the place is run today. They are clearly very focused on the skiing experience and manage grooming and avalanche control very well. Everything was open when we were there during a very heavy snow cycle that closed a lot of the exposed terrain at Fernie on the same trip. The base village was very small at the point we visited which was only 10-years into the resort’s existence, but there are big plans for it in the future. We found a great restaurant for lunch: Rockford Wok Bar & Grill. There are 2 other restaurants to choose from in the village and a large cafeteria at the mid station of the Gondola as well as one at the top. This provides a nice variety of places to eat. The town of Revelstoke is down the road from the resort a few miles, and that’s where we stayed. There is a hotel at the base village and some condos, but most of the lodging is still in the town. It’s better to stay there anyway because that’s where the apres action and best restaurants are. Can’t think of anything else — go there! This is the best skiing in North America and is at the top of our list of places to revisit. We were on a schedule when we visited the first time so only had one day to ski, which is crazy and needs to be fixed with a follow-up trip.